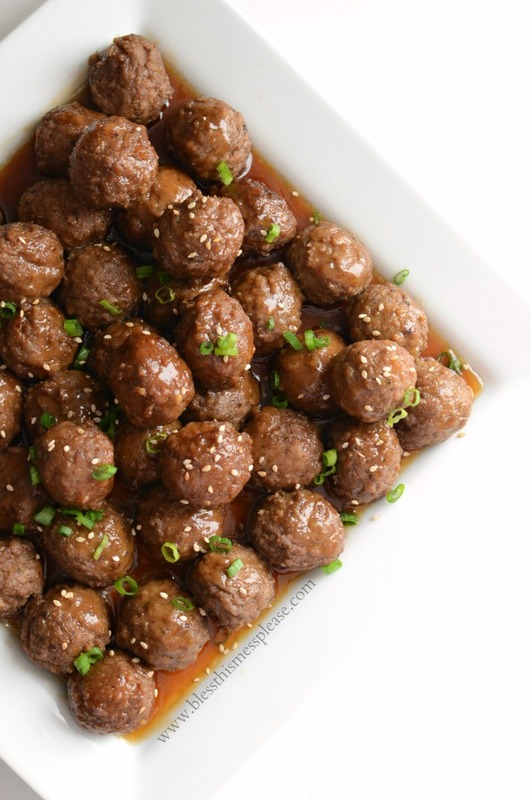 Slow Cooker Honey Teriyaki Meatballs are sweet and savory, without being spicy. And the best part? You get to eat the meatballs with a toothpick. Bed sheets, an old teddy bear robe, and sunglasses… those are the things our annual Nativity reenactment is made of. Every year on Christmas Eve, we gather at Thomas’ parents’ house for a finger food/appetizer dinner, followed by a reading of Luke 2. It’s not just a reading mind you, it’s a full-on family production of the Nativity, costumes included. This tradition is light-hearted and a memory maker, but it still keeps the true spirit of Christmas and why we are all together at the forefront of our evening (pictures of this funny tradition at the end of the post). Sometimes on those busy evenings filled with family and friends, laughing and games, I (and everyone else in the family) don’t want to be stuck in the kitchen. Of course, food is a big part of celebrating, but that doesn’t mean I want it to be the only part I get to participate in. This time of year is when I turn to some of my favorite family recipes that use a few quick and easy ingredients that I don’t buy much the rest of the year. Taking out some of the work and prep this time of the year means that I get to spend more time doing other things! More time for gift wrapping, Christmas story reading, cookie baking and delivering, and hot chocolate drinking is always a plus in my book. 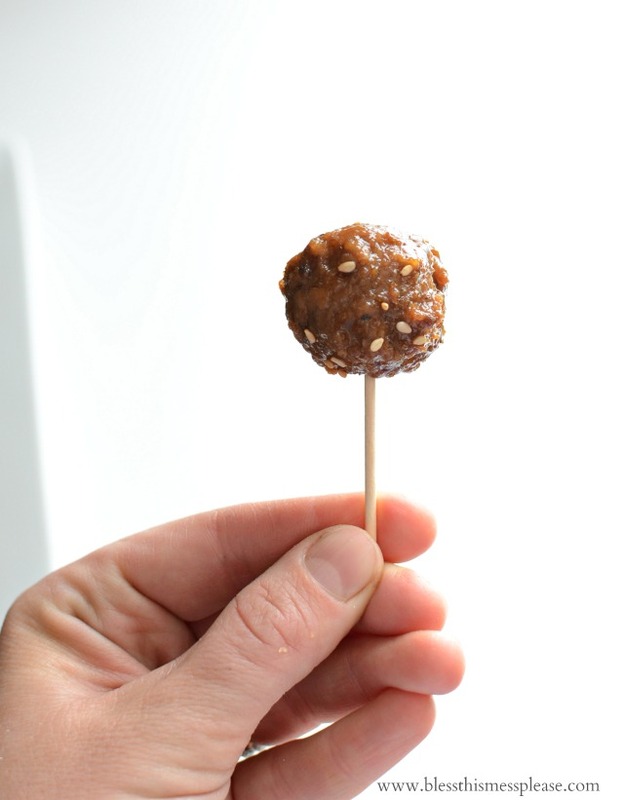 This week I’m sharing quick and easy recipes that are perfect for a party, and I’m starting with these amazing (and simple) Honey Teriyaki Meatballs. Making a homemade teriyaki sauce is super simple. Add it to some pre-made frozen meatballs in the slow cooker, and you have a great party dish that practically makes itself. I love using the slow cooker for party prep because it means I can have something else cooking in the oven too. I had the chance to work with Casa and their frozen meatballs on this recipe, and I jumped at the chance. I’ve used Casa meatballs before and loved them. They taste great, stay together well once cooked, and come in a big 6-pound bag at Sam’s Club. That bag is good for two parties most of the time, so it’s a great deal! I know I’m not the only one who plans life around sample days, so I thought I’d let you know that you can try Casa meatballs at your local Sam’s Club (store locator here if you need it) on December 20, 21 and 27. Long live the product demo. Casa not only asked me to make a fun recipe, but they got a few other amazing bloggers on board, and we are all sharing recipes today. Be sure to check out the recipe swap at the end of the post. There are some mouth-watering recipes today! This dish was great. It was sweet and savory without being spicy (though a little spice would be lovely, I do try to avoid it for most family parties). And the best part? You get to eat the meatballs with a toothpick. Everything tastes better off the end of a toothpick! Am I right?! My kids are already asking me to make this again. In a medium saucepan add the water and the corn starch and whisk to combine. Add the sugar, honey, soy sauce, garlic powder, and seasame oil to pan and stir to combine. Heat the pan over medium high heat, stirring often, until the mixture comes to a boil. Boil for 2 minutes until the mixture thickens. Remove from the heat. Place the meatballs in the slow cooker and pour the sauce over the top. Cook according to package directions (3 to 3 1/2 hours on high for half a bag). Stir gently half way through cooking and once again before serving. 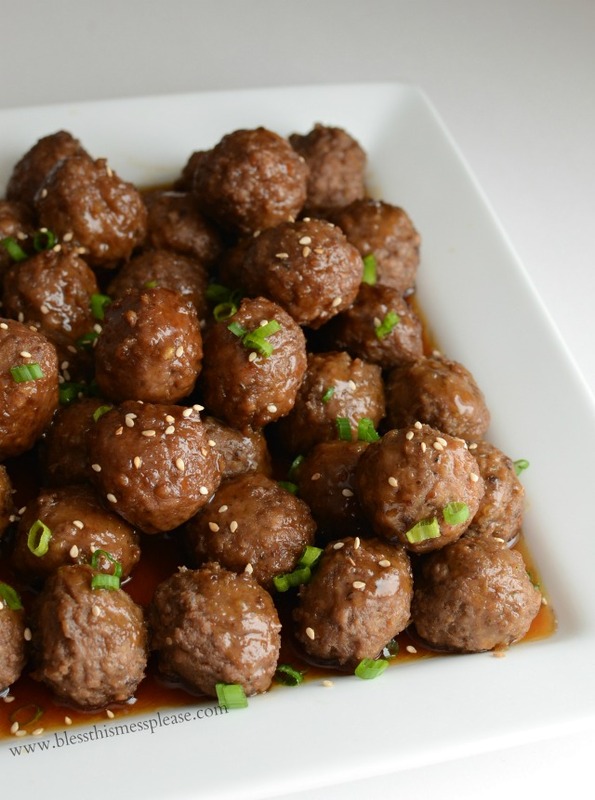 When you are ready to serve you can dish the meatballs onto a serving dish, ladle some of the sauce in the bottom of the slow cooker over the top and sprinkle with sesame seeds and chopped green onion OR you can just serve them right out of the slow cooker as they are. The slow cooker is a great party option because it will keep them warm for good long time. Recipe exchanges are the best. I’m really excited to be a part of this one. If you aren’t headed to a party, this makes for a fun dinner. I served the meatballs with a side of buttered egg noodles and some steamed veggies. It was a great meal the whole family ate really well. Lots of the other recipes above were for main dishes too. Having a few quick dinner options around is always nice. Aren’t family traditions the best? Stayed tuned for a whole week of quick and easy recipes that are sure to make your next holiday party a breeze. Disclosure: This was a sponsored post by me for Casa. Thank you so much for supporting me and the companies that I very thoughtfully select to work with. 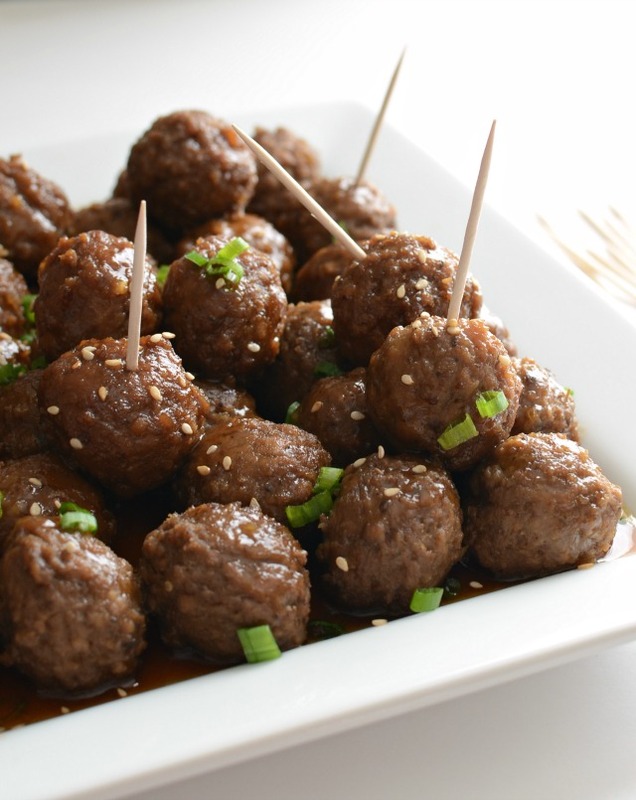 I love these types of slow cooker meatballs. They are great for parties, and unexpected guests. My husband and I are going to try these tonight! I saw your recipe on Foodgawker and I can’t wait to taste them! Thanks for sharing! This looks so so so good! Recipe Success! My google search for teriaki meatballs brought me here and I couldn’t be happier. I threw this together for dinner tonight (served over rice — I also tossed in some red bell pepper and onion strips to round it out). We will definitely make this again. Thanks! Your dish looks so delicious! What should i use to replace the roasted sesame oil when i run out of it? It’s a great addition but if you don’t have any I would omit it all together (doesn’t really have a replacement and you won’t need additional oil), so if you are out just skip it! This was really good! I cut the sugar in half and used brown sugar instead because it was what I had. I also added a half tablespoon rice vinegar and some powdered ginger to balance the sweetness. The kids loved it!! I used frozen chicken meatballs from ikea. Cooked stovetop. Will keep this recipe!! Thank you! Those meatballs sounds awesome! I’ll have to check them out, I have no idea Ikea sold meatballs!